Large numbers of people and birds flocked to the beach at Mile 8 just north of Swakopmund to scoop up thousands of small fish on the rocky reef after a sulphur eruption in the water forced an entire school to the shallow water. The Atlantic Ocean has turned a bright turquoise green in large patches along the central Namibian coast which means an algae bloom has occurred which in turn created an unexpected feast for humans and bird life. During the summer, sulphur eruptions occur in inshore waters and cause an untenable situation for marine life because of a lack of oxygen in the water. Such eruptions of algae are accompanied by a characteristic pungent smell of sulphur along the coast. Bottom-dwelling bacteria produce sulphur as a product of decomposition, and they may form patches of concentrated sulphur. Such complex chemical and biological processes are often associated with the occurrence of harmful algal blooms, causing large-scale mortalities to fish and crustaceans. The algae blooms usually occur along the Namibian coast especially in the central region, between Cape Cross and Conception Bay. Decay of blooms known as red tides can also lead to localised oxygen deficiency and promote the formation of highly toxic hydrogen sulphide. Oxygen deficiency cause krill, a small prawn like crustacean, to die of in large numbers and fish to seek out shallow water in order “breathe”. If such an algae bloom continues for extended periods it has the potential to damage various mariculture projects along the coast. The offshore oyster industry often bears the brunt of such occurrences and a few years ago several companies in Walvis Bay and Lüderitz were forced to start from scratch after a sulphur eruption devastated offshore aqua culture farms. 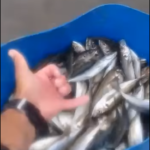 According to the spokesperson of the Ministry of Fisheries and Marine Resources, Dewet Siluka, A team of marine biologists and scientists was dispatched to the Mile 8 to analyse the water to determine what caused the large school of horse mackerel to move so close in to shore. The large amount of people at Mile 8 scooped up large amounts of the horse mackerel with the aid of shopping baskets.